A pastor recently shared this great idea with me. He had all the young kids in his congregation learn the Old Testament Bible timeline. He got the timeline cards from On My Heart, a Lutheran memory work program. During children's messages he would teach the children (and adults if they were participating) the timeline with motions and every week he would add a few more. The kids can now tell the whole Old Testament story of God and His people in order with motions. HOW COOL IS THAT? 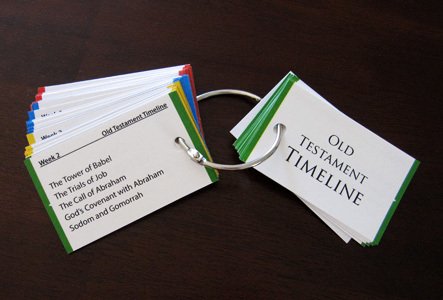 There are a number of ways these resources can be used and there are three sets of cards available: Books of the Bible, Catechism (doctrines of the faith), 60 commonly memorized Bible verses, and the main events of both Old and New Testament timelines. As kids get older (and definitely in or by confirmation) they should actually read the Bible so that they start learning the accounts in more detail but what a great way to start getting kids familiar with the whole Old Testament story of God and His people!